Scared ME off, I think. So, Luci is taking Castela’s power for granite. Gneiss! Good Lord! The pun jar melted! Just as long as nobody makes a “Cummingtonite” pun we’ll be safe. I think the pun jar is gravelly damaged. Jon replies with the Pun Hammer! Lucci felt the earth, move, under her feet and the cliff went tumbling, tumbling. Three comments in on this comic and we are already off to a rocky start. Holy shist, I came looking for copper, &found gold! If this thread goes on much longer, the pun jar will collapse into a point-singularity. That’s our unflappable Luci: COmes face to face with a Sphinx in full “terrorize the interloper” mode, hugs it. Bounces down a cliff in a springy ball composed of her new sentient plant student/friend’s body, criticizes said friend’s technique for getting her down the cliff. And now, she witnesses the same friend vaporize a large chunk of cliff wall, and tries to calculate the amount of energy used. I’m really beginning to like Luci and I’m hoping she never attains para status. I want her to remain that one human friend who is friends with paras, knows what they are, and doesn’t care. I miss the comic having some kind of reliable grounding to reality. Also, depending on how good her math is Luci might be able to figure out what Castela’s -limit- is. The energy has to be coming from somewhere after all, so there is likely a point where she would be exhausted/it could be deadly if she pushed further. I’m thinking this is more like Star Wars 7, where the First Order had their planet sized DeathStar weapon, that sucked energy directly from the sun, processed it, then fired it out to destroy a planet light years away. Castela seems to have almost that much power. I think “grounding to reality” is hopeless. Instant body morphing and hammerspace physics pretty much puts that notion to rest. The only grounding we have here is that all the participants are at least nominally human in character, some more than others. You have spelled MASER correctly, but your description of how it functions is not (quite) right. MASERs are like a LASER, but function in the microwave portion of the radio frequencies. It does tend to cause heat at the point of impact. I think we have established in the past that Cas uses directed plasma discharges though. I think Cassie just knocked down a sixty-foot tall chunk of rock. Um, yeah, there were more than a few dozen slugs of momentum there Luci. I never figured Luci for a math whiz. Hah! Recoil, I knew it. That was a transfer of Force not Heat, and produced a spray of fine Dust, not molten Lava. Cassie’s Artistic efforts have taught her a degree of Control. Those artistic efforts may have paid off in the form of doing more damage with far less energy. For instance, what if that “beam” she emitted was actually thousands of microscopic beams intended to drill. Once deep enough the heat builds up inside the rock rather than on the surface and blasts the surface away with a minimum of energy input. Tunnelers would pay a fortune for a technology that could transform hard rock into road paving. Ooh, diffuse thermal shock fracturing! Luci is a total geek; she may be an ANGRY geek, but she’s sill a geek! And Cassy still has so many more options to explore before she achieves her Final Form. I really hope that Paul will draw the new image of the cliffside so we can see how much of it was blown away. All of you do know that Castela’s venting would not go unnoticed at the REAL Canyon de Chelly. There are Navajo people living all around and down in the canyon. I took school field trips there when I was a kid. It’s not isolated. It was explained in an earlier strip that this is a reserved area in the canyon. 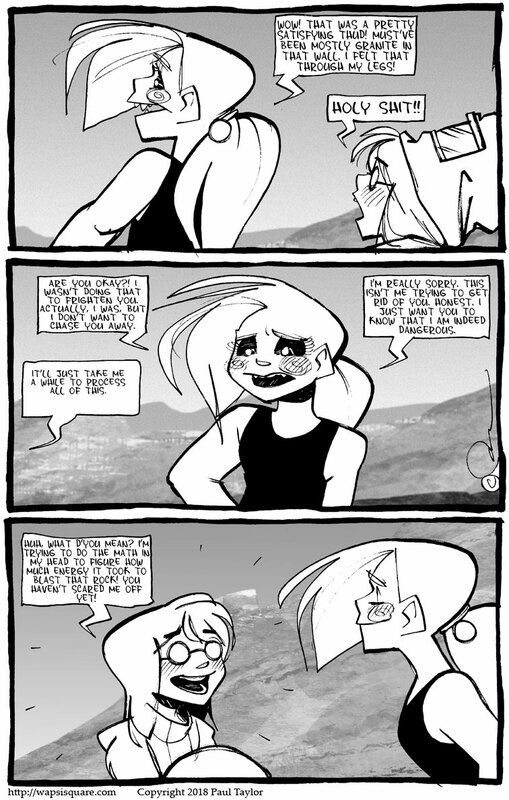 The link to the strip where Bud introduces Castela to the canyon, and she tells Castela that this part is assigned to her, and for Castela to ‘have at’ the rocks. It’s also where Pickle ruins her first boot. I’m just saying that in this alternate world, this could happen. In the real world, park rangers would be all over this kind of thing from the first time. Well, sure; in the real world, Canyon de Chelly is not protected by the MIB. Short cute girl with tats and a bit of a psycho streak. Luci even without a large chest to hit the perfecta is just what I like. I think I missed something… I look in the archive from 13 years ago, and I get the impression of Luci as a mid-20-something. Now I’m reading her as mid-teens? Is Luci aging backwards? Did she drink from the wrong water-fountain? And Fangirling a LOT! Large amounts of enthusiasm and energy often make people seem younger than their chronological age! Please delete this comment and the one above it. Okay, I’ll try, but you are more likely to be able to yourself.